Plain text files, HTML files and software source code are all different, and so are your habits and preferences for editing them. Using a single text editor to edit all your text files should not force you to edit all those files in the same way. 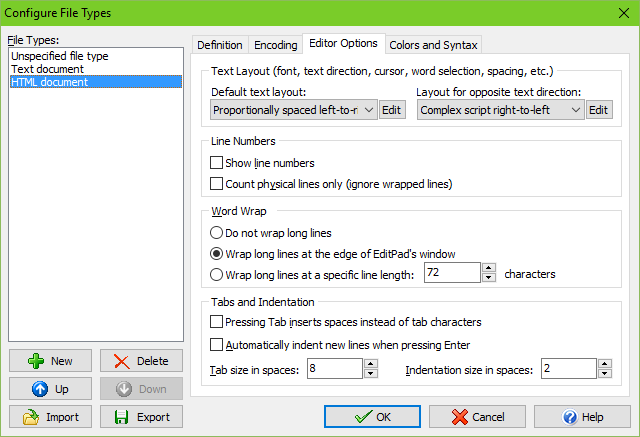 You can configure most of EditPad Lite's text editing options for each individual file type. If after some time you find EditPad Lite doesn't do things the way you want, there's likely an option for it in the file type configuration. Definition: The file type definition determines which file type's settings EditPad Lite will use for which files. Since file types are usually indicated by their files' extensions, you'll usually specify a list of extensions such as "*.htm;*.html" for HTML files. For files without or variable extensions, you can specify other file masks. 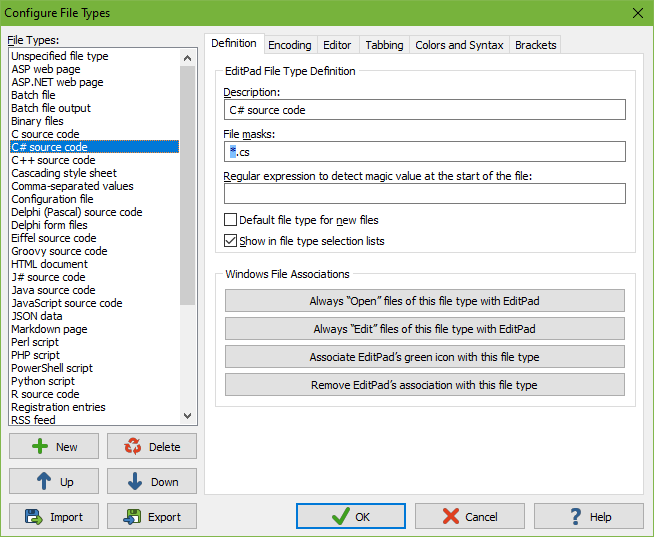 A unique feature is EditPad Lite's ability to detect magic values as the start of the file, such as the DOCTYPE declaration for HTML files. Encoding: EditPad Lite edits all text files. Open text files saved on Linux, UNIX and Macintosh computers, or even text files from old DOS PCs or IBM mainframes. EditPad Lite preserves the file's compatibility with those systems, unless you explicitly convert it. You'll never have to worry about being unable to open a text file, and you'll always be able to save your files in a format that people with less flexible text editors can read. EditPad Lite handles DOS/Windows, UNIX/Linux and Macintosh line breaks. 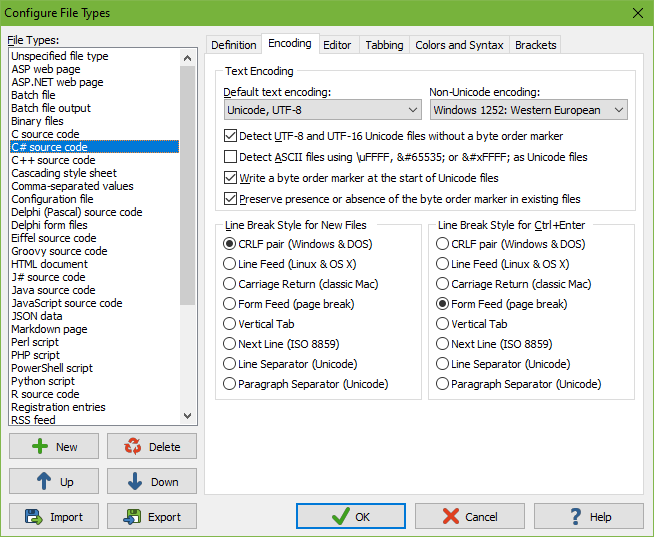 Open and save text files encoded in Unicode (UTF-8, UTF-16 and UTF-32), any Windows code page, any ISO-8859 code page, and a variety of DOS, Mac, EUC, EBCDIC, and other legacy code pages. Editor: Choose one of the preset text layouts for left-to-right, right-to-left, or complex script text editing, or configure your own for maximum control over text direction, cursor movement, word selection, text spacing, and fonts. For line-based file types, you can turn on the option to show line numbers. Lines can be numbered with or without taking word wrapping into account. The automatic indentation option makes it easy to maintain indentation when adding lines. Indentation and tab sizes are also fully configurable. Colors and Syntax: Change EditPad Lite's appearance to suit your tastes and eyesight. Select one of the one-click color configurations, including one with white text on a black background that's easy on the eyes. 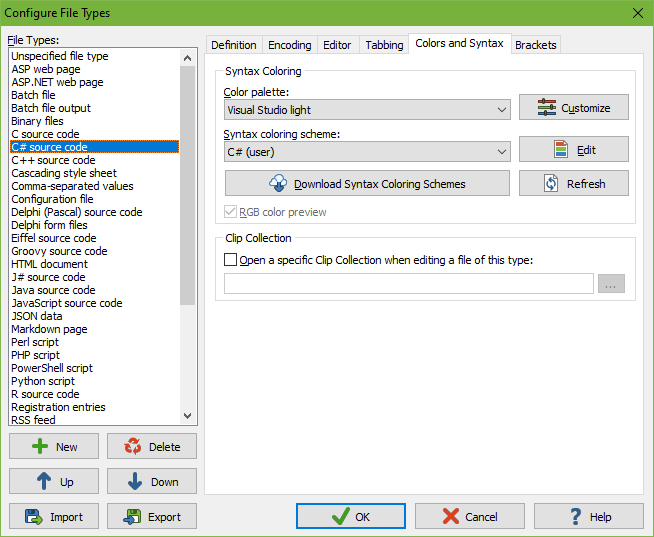 Or, select the CodeGear or Visual Studio options if you're used to the colors in CodeGear's and Microsoft's IDEs. You can use any of the predefined configuration as the basis for your own.